Focus your attention on collaboration and the considerations of deployment. Determine whether you'll migrate to SharePoint 2016, and if you do, understand what challenges you may face. Explore a variety of topics including content management, governance and retention, search, office apps, and support. 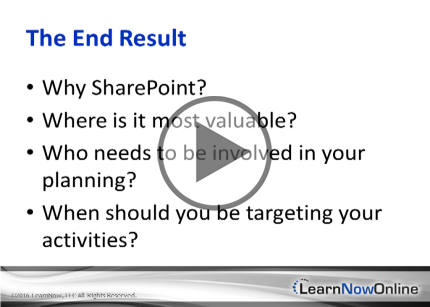 Discover why you should use SharePoint, how you can get the best return on your usage, and what features are most valuable to you. You should have some familiarity with programs associated with Microsoft Office. No programming or SharePoint experience is required.